I was recently out taking my son to get a haircut. His barber knew from previous conversation that I was involved in the fashion industry. On this particular day he decided to tell me that he was interested in doing a denim line and wanted some advice. He told me that he had people working on his logo and that he also had found a local seamstress. He asked me how he should go about starting his clothing business. We began to chat as my son was in his chair. I love talking fashion so I didn’t mind it one bit. But it also reminded me of myself many many years ago. Boy how time flies! Truth is how to start a clothing business goes beyond a few minute chat. It is an exercise in wit, timing, knowledge, passion, energy, fortitude and yes a tad bit of luck. But there are tools available that can help you increase your chances of success. That is what StartMyLine.com is all about. Being a clothing line owner means long hours and the constant mind spinning of ideas and concepts. It is exhilarating to say the least. Being a part of the fashion industry is like no other. If you give up easy then you may want to reconsider your career scope. The best advice for creating a clothing line is preparation. Preparation is acquiring detailed knowledge of the inner workings of the industry so that you can make informed decisions and not waste a lot of money. It is empowering yourself to be able to do certain functions of running a fashion label yourself and knowing which components to outsource. The more you can do yourself means the less money you have to pay out. Example – why hire a fashion designer when you can design your line yourself with Digital Fashion Pro. Creating a solid business plan is still highly recommended. Many new entrepreneurs believe they can skip this part. Please Don’t! A detailed business plan as to how you plan to develop your clothing line, manufacture it and market it is pinnacle. Take time to map out your plans and get real amount figures so that you know how much it will cost you to start your line. We have tools here at StartMyLine.com that can help you with that. There are so many details between having a clothing logo and having a manufacturing contact that new designers should be aware of. Sure you can go it alone and find out things as you go and probably waste a lot of money and time in the process. But why do that when you can tap industry experts for help so you can give yourself a greater chance for success and give your line the competitive edge. Utilize our website, our fashion business and design tools plus other information available on the web from places like howtostartaclothingcompany.com. Good Luck With Your Line! Detroit, Michigan – May 18, 2017 – StartMyLine.com, a website specializing in fashion business tools, fashion design software and help articles, officially launches today with the goal to empower beginners and aspiring fashion designers with total DIY solutions to help them successfully break into the fashion industry. Going beyond help and how-to articles, StartMyLine.com has actual tangible products that directly, aid in giving aspiring designers the ability to design their own clothing lines, a step by step course to guide them through setting up their own professional fashion label plus manufacturing contacts who can make their clothing. 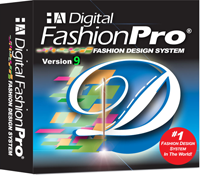 Even beginners that can’t draw will find solace in working with their easy to use fashion design software system Digital Fashion Pro. 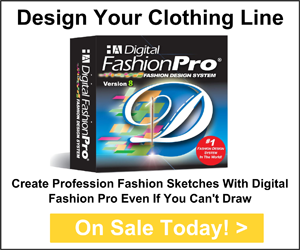 Digital Fashion Pro gives users the ability to create professional digital fashion sketches that will help in the development and production of their clothing lines. The all-new Digital Fashion Pro 9 is officially releasing today as well. “It is the most powerful and easy to use version yet as it comes with more tutorials and more clothing templates,” according to StartMyLine.com marketing director John Thomas. StartMyLine.com is a US-based web company under Harper Arrington Publishing LLC that specializes in fashion business tools; fashion books and fashion design software. This mission of StartMyLine.com is to empower and help the next generation of designers, and clothing line startups succeed in the world of fashion. StartMyLine.com serves clients and the fashion community at large in over 50 countries. Fashion designing & starting a clothing line is super exciting! Seeing people wearing your designs is an awesome feeling. But just how do you go from having a fashion or style idea to getting it into the hands of consumers? Whether you have one great fashion idea or many – execution is everything! Beginning the process to launch your own clothing line as a true beginner / aspiring fashion designer brings about questions such as where to start, how to find clothing manufacturing, how much will it cost, finding investors, how do you design your clothing, how many pieces should be in your collection and how to ultimately get your line sold in stores. We are here to help! Let StartMyLine.com help you start & design your own clothing line like a pro. We can help transform you into the Ultimate Fashion Designer. 1. Don’t hire a fashion designer to design your line because you can do it yourself and save time and money. You may be wondering how can you do that if you can’t draw, can’t sew and never went to fashion school. Great news – you can still have a successful fashion career or clothing line without them. There are few key points you should consider. The first is you must be able to have professional digital fashion sketches to represent your designs. You don’t want to send amateur hand drawn sketches to a manufacturer or seamstress. Remember you want to be professional! Clothing manufacturers, sample makers and seamstresses can spot an amateur right away by their sketches. Make sure you are sending manufacturer-ready digital sketches that are clean and accurately convey your design idea. 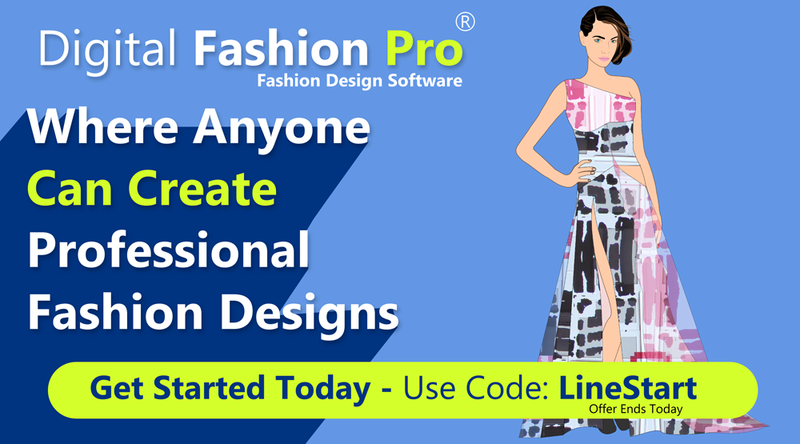 A highly recommended tool to create your fashion designs with is Digital Fashion Pro Fashion Design Software (DigitalFashionPro.com). It is affordable and very easy to use even for first time users. Plus you do not need to know how to draw at all to use it – which means that anyone can crank out industry standard digital fashion designs. It is widely used in the fashion industry by beginners, professional fashion designers, clothing lines and schools in over 50 countries. You can design Men’s and Women’s T-shirts, Jeans, Dresses, Jackets, Shoes, Handbags and more. Being able to use in-system digital fabrics + the ability to add your own prints, artwork, logos & fabrics are huge pluses! Digital Fashion Pro Discount Code: linestart. Learn more about Digital Fashion Pro. 2. Don’t just start your line without knowing how everything works. Read articles online but a true recommendation is the Official Step by Step Guide to Starting a Clothing Line Course Book. You will definitely find this item highly valuable. This course will give real world advice and tips related to starting your clothing line, designing it, working with manufacturers & quality issues. You also get very valuable insight on marketing your line and how to get retailers to carry your collection. Learn about working with sales reps, pricing, wholesaling, collections, protecting your designs and creating a budget for your line. If you want to know the ins and outs of getting your label up and running effectively then this guide is a must have! 3. Next you want to be able to contact a few different manufacturers to make your line. You want to judge them based on quality, price, quantity, turnaround time and proximity to your headquarters. A terrific resource for finding manufacturers in your country and outside of your country is the HA Ultimate Fashion Contact List of Over 500 Clothing Manufacturers eBook. 4. Next you need to be able to create spec sheets and measurements for your designs in order to present them to manufacturers. This is another key indicator to the companies that you are going to work with that you are indeed worthy of their time. The best manufacturers want to work with the best lines to whom they potential growth, profit opportunity and long term cooperation. They will not waste their time, offer their best pricing or devote significant resources to your line if you appear inexperienced and unprofessional. See #2 resource above as well. Presenting professional digital fashion sketches and a sound business appearance are critical when trying to get the best manufacturers to work with you. It is also highly recommended that you submit your digital sketches, garment measurements in an industry standard way. Here are two resources that can help you with spec sheets and garment measurements / grading: The Fashion Business Center and the Spec Book with Standard Garment & Body Measurements. Good luck on getting your line started. Drop of a line once you get up and going 🙂 If you need specific advice – ask us. AD: Register Your Clothing Line Domain Name – Be sure to Lock down your domain name for your clothing line with Godaddy – .99 Cent Domain Name right now if you haven’t already. Getting the domain name you want for your line is important and will inspire you as you get things going.